This article presents a description of circular or ring buffer, explains the benefits of it and shows how to use this data structure in video recording. 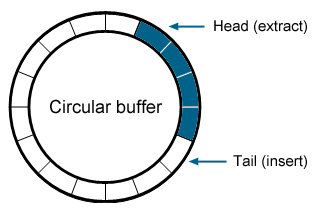 A circular buffer (or ring buffer) is a first-in first-out data structure that uses a single, fixed-size buffer as if it were connected end-to-end. It is a circular software queue. This queue has a first-in-first-out (FIFO) data characteristic which makes it capable to collect data continually. These buffers are quite common and are found in many embedded systems. Usually, most developers write these constructs from scratch on an as-needed basis. Ring buffers are incredibly useful when processing asynchronous IO. They allow one side to receive data in random intervals and in random sizes, but feed cohesive chunks to the other side in set sizes or intervals. Circular Buffers are used for data transfer between two processes. The Producer process places items into the Circular Buffer and the Consumer process removes them. The variable capacity of the Circular Buffer accommodates timing differences between the Producer and Consumer processes. Create - Makes a new ring buffer. Destroy - Destroys an existing ring buffer. Connect - Connects to an existing ring buffer. Put - Inserts data into the ring buffer. Get - Retrieves data from the ring buffer. WaitUntil - Blocks until the ring buffer satisfies some condition or predicate. Peek - Exactly like get however the get pointer is not updated. This data structure allows us to record only a specified length of video files (e.g. 5 minutes). It is very useful when you would like to launch a long-term recording process but your storage capacity is limited.